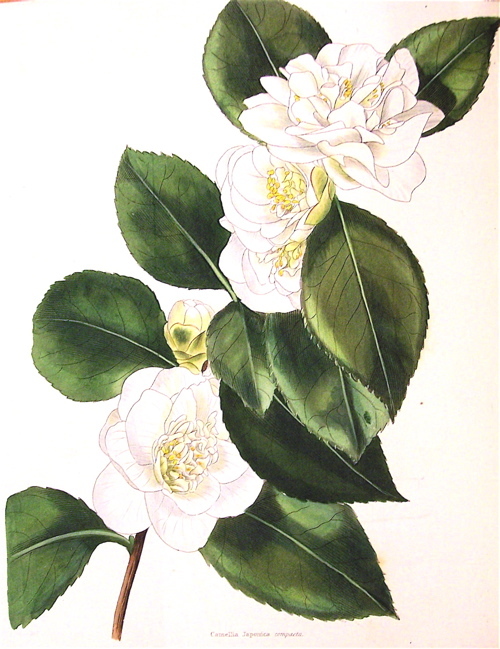 A cultivar of Camellia japonica L. ‘This is a neat, small flowering variety, distinct from every other white, having a great deal of the character of the C. sasanqua in the flower, but the leaves of Japonica. We believe that it was raised by Messrs. Young [of Epsom, England].’ [LBC no.1836/1832]. ‘Bud oblong, small, scales green; flower small, fourteen lines in diameter, double, of a very pure white; petals, of the three exterior rows, firm, perfect, well imbricated; those of the centre numerous, small, erect, fasciculate, regular, in the form of a lance head, and intermixed with some fertile stamens.-Superb.’ [Berlèse Monography p.47/1838]. It was listed in Loddiges’ Nursery catalogues of 1830 and 1836, copies of which are held at Camden Park. [CPA]. Desideratum to Loddiges’ Nursery on the 6th January 1845. Not recorded as received and there are no further records. [MP A2933-2, p.28]. In the copy of the the 1836 Loddiges’ Nursery catalogue held in the Camden Park Archives compacta is marked with an ‘x’ which elsewhere means common before or long introduced, but the meaning here is unclear.